I figured there was no better way to celebrate than with beignets! I might have shared this story before, but way back before my family moved to Colorado my mom and I spent a Saturday, shopping, plotting our escape move to Colorado, and eating our weight in beignets. It’s so weird because I remember that day like it was yesterday, but it was actually over nine years ago. It was the first time I’d ever experienced a beignet before. It was very out of character for us to one, even buy food while out. A big family means we had to save money wherever possible and that meant buying food while out was a major no. And two, it was very out of character for us to order something sweet that was not chocolate. 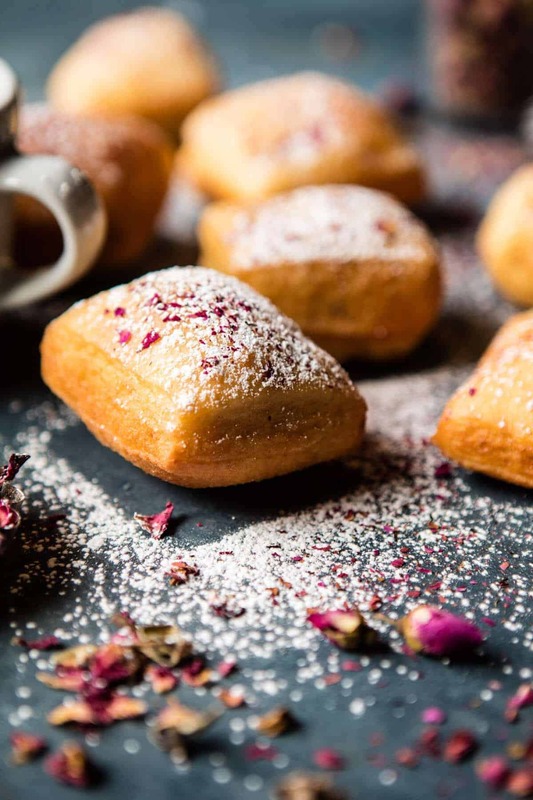 But these beignets…they where so, so, so good! Light, with giant air pockets in the center and basically just covered in powdered sugar. They were a fourteen years old’s dream. I do however think that part of the reason I have such a fond memory of those beignets is because it was such an awesome, careless day spent with my mom. 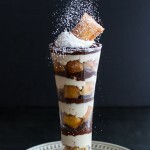 Ever since then beignets have always been kind of special to me and over the years I’ve created a couple versions…say hello to this beignet tiramisu and these Nutella stuffed beignets. 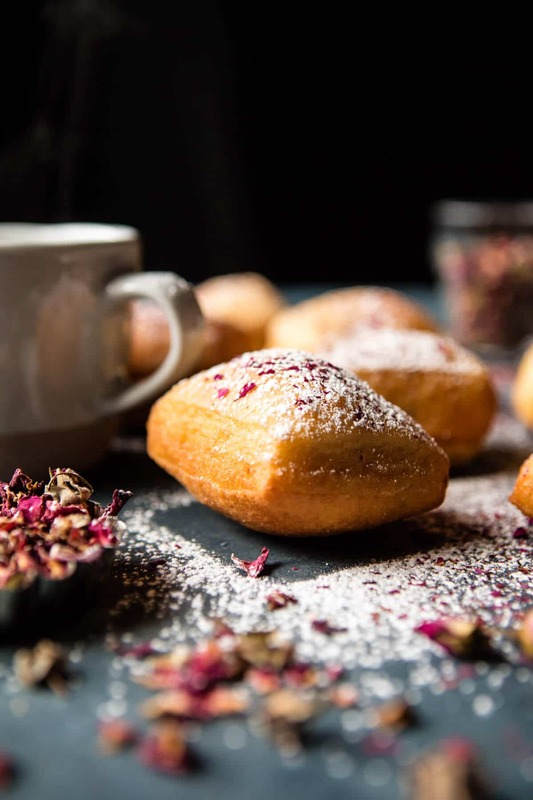 Both of those previous recipes have chocolate, but these cardamom rose beignets I’m sharing today, are much more like the ones mom and I enjoyed…about nine years ago now. <–CRAZINESS. Honestly, at this moment I would give pretty much anything to go back to that day and eat all the beignets, but that’s only because I’m not feeling my best. I’ve been seriously dragging since Sunday afternoon and it is safe to say I am over it. 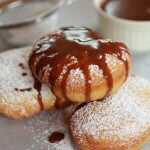 OH well, thinking ahead to brighter days, so let’s keep talking about beignets…ahh, does that rhyme? I think it does…cool. cool. 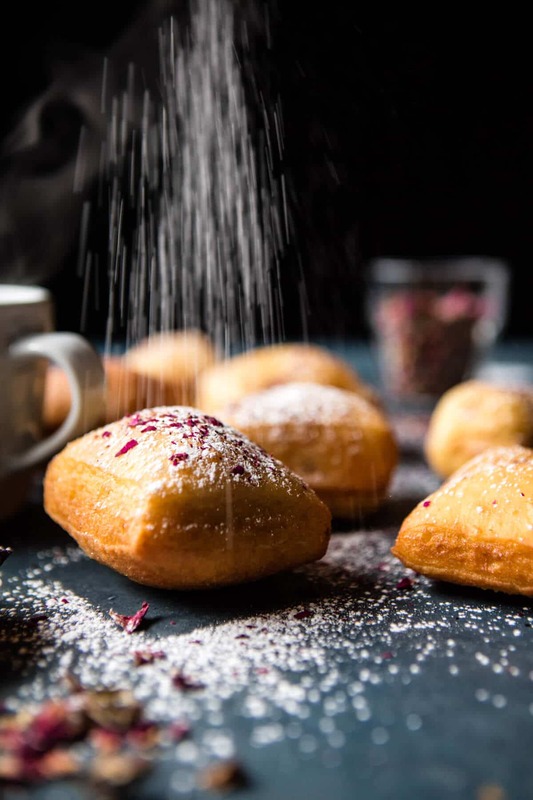 I think as far as the classic beignet goes, these are my favorite…at least that I’ve made yet (always working o. I know they’re not crazy classic, since they’re flavored with rose and cardamom, but texture wise, they are spot on. Here’s the deal, if you have never attempted making beignets, please do not be fearful. 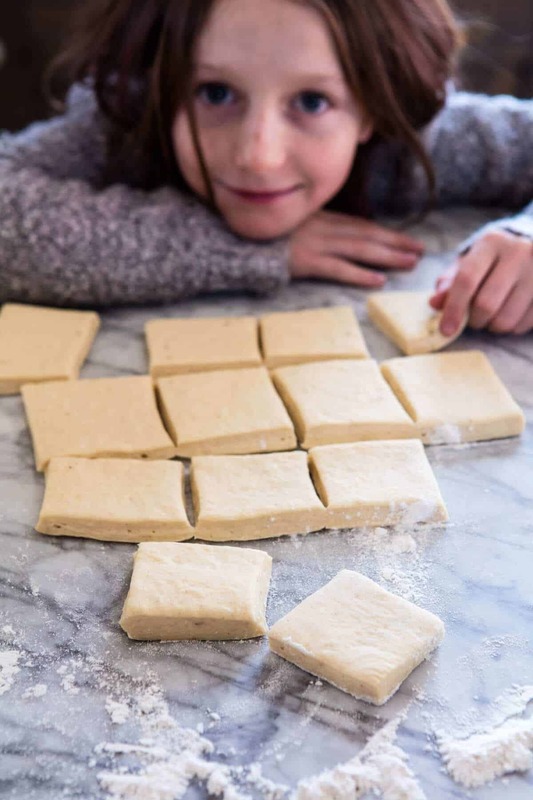 They are one of the easiest doughs to make. And while they are fried, they are totally worth the effort of breaking out the oil. Trust me. The dough is pretty basic, some flour, an egg, a little buttermilk, etc. I added in some rose-water and cardamom because I am currently loving the two of these flavors together, they just complement one another so well. 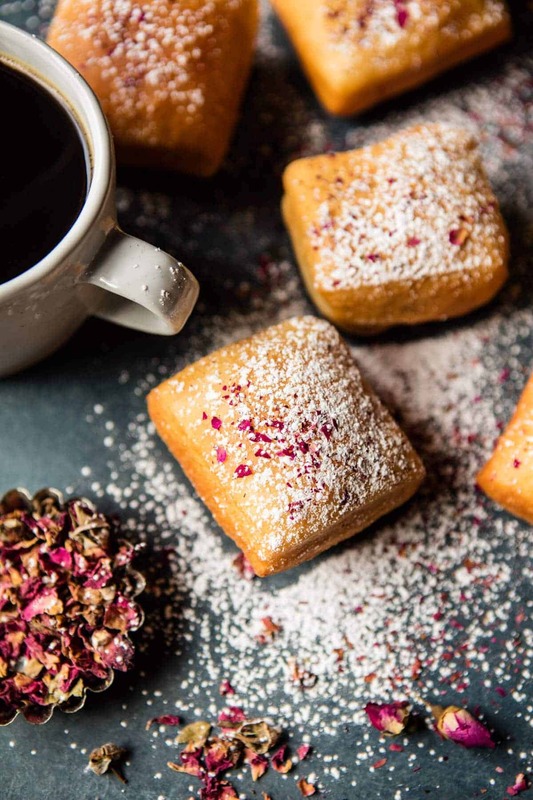 Plus, the sound of the cardamom and rose with a light doughy beignet covered in powdered sugar…while it was just too good to pass up. If you’re not into the rose-water, that’s totally fine too. You can omit it and I promise these will still be delish. The rose-water is just one of those “fancy extras” that I love throwing into recipes when appropriate. The cardamom however is a must…or in my opinion it is. 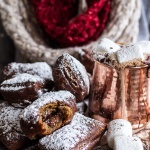 It takes the beignets to a whole new level of cozy awesomeness. Plus, if you eat your beignets while drinking coffee, which I highly, highly recommend, you’ll see that you’ll have found the perfect paring! 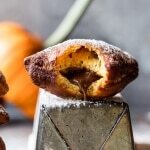 Think cozy latte meets sugary, fried beignets. YUM. Normally, I would not share such a decadent treat on a Tuesday, but it’s Fat Tuesday, so I’m feeling like fried things are a must, I mean, right? RIGHT. But ahh, if you are looking for a slightly healthier dinner to balance out the beignets may I suggest these lighter shrimp po boys? They’re kind of perfect too. 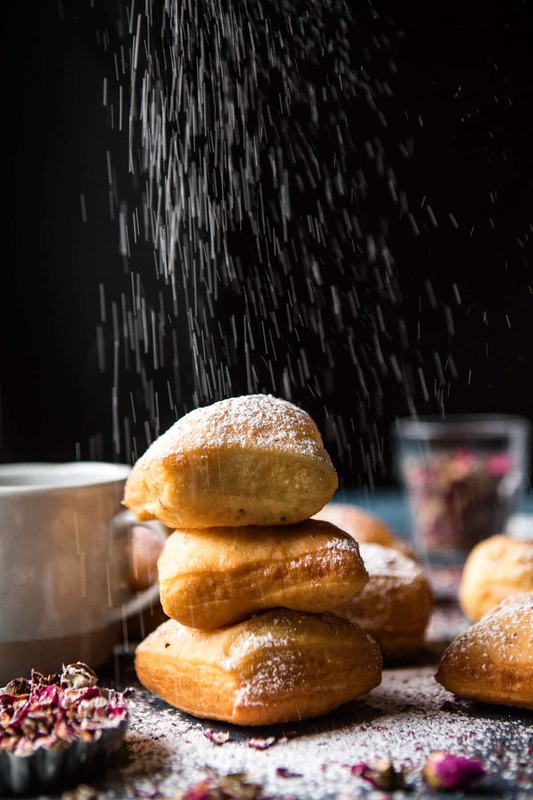 Beignets are a perfect sweet treat, and they only take 30 minutes to make! 1. Mix the yeast, brown sugar, and water in the bowl of a stand mixer fitted with the dough hook. Let sit for 5 minutes and allow the yeast to proof, it will foam up. Then add the eggs, salt, buttermilk, melted butter, vanilla, rose water (if using), 2 1/2 cups flour, and the cardamom, mix on medium until combined. Continue slowly adding the remaining 1/2 cup of flour until it is all incorporated. The dough will be sticky. At this point begin adding 1 tablespoon of flour at a time until the dough pulls away from the sides and forms a smooth ball (about 4-6 minutes). 2. Spray a bowl with cooking spray and place the dough inside, cover with some plastic wrap on top. Let rise for 1-2 hours in a warm spot, or until doubled in size. 3. Turn the dough onto a floured work surface. Roll the dough out into a large rectangle, about an 1/4 inch thick. 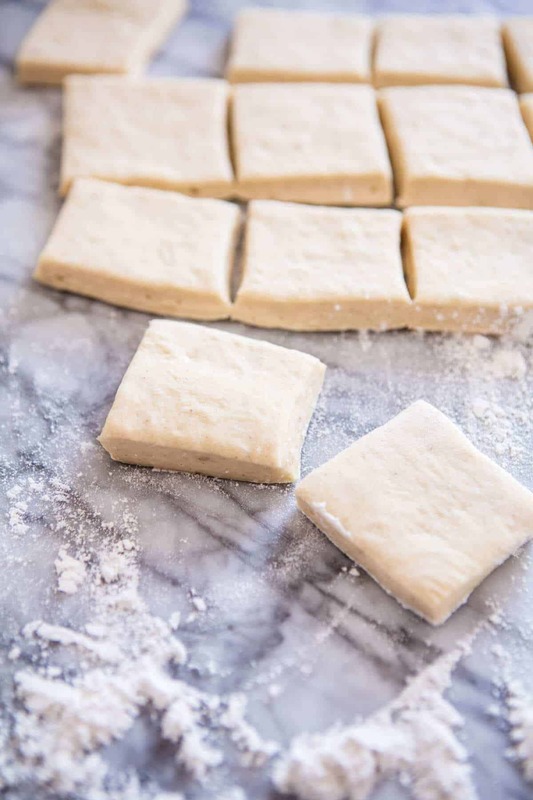 Use a knife or pastry cutter to cut into 3×3 inch squares (about 25 squares). Cover with a damp kitchen towel while the oil preheats. 4. Place a deep, heavy bottom pot on the stove and add enough oil to fill the pot about 1 to 1 1/2 inches deep. Turn the burner to medium and preheat the oil to 350 degrees F. Fry 4-6 beignets at a time depending on the size of your pot. Use a slotted spoon to flip them over every 30 seconds. Fry for 2-3 minutes or until golden brown on both sides. If they are taking longer than 3 minutes to brown you need to turn your burner up and make sure your oil is at the correct temperature. Remove with the slotted spoon and place on paper towels to drain. Repeat with remaining squares. Dust each beignet generously with powdered sugar. EAT! Lastly? Be sure to really cover those pillowy beignets in powdered sugar. It is the only way. 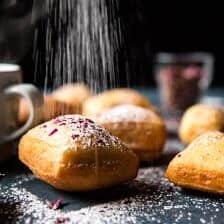 Anyway, loooove the look of these beignets – we only have apple beignets around New Years’ here in the Netherlands, and I always wish I could eat them year round… So I’m definitely going to try these! Yumm! That is so true, I never realized thats what was happening I think! So happy you like them Vivian, thanks so much (: PS they totally should be a year round food! Love these Tieghan! Yep. Rose and cardamom are a done deal aren’t they? It did take me a while to acquire the taste for rose, but I’m kinda hooked now! Thanks Debs! It so took me a bit to start liking them too! Put it with cardamom and its so good! Where can you buy those rose petals? So sweet! Laissez les bon temps rouler! 70 years ago while visiting my Irish grandmother about 40 miles from my Connecticut home, she took me to a downtown bakery where I stood, fascinated, up close to the doughnut machine which automatically flipped the donuts cooking in oil. Years later, I enjoyed beignets with chicory coffee at a cafe down by the river in New Orleans. Thanks for bringing all those food-oriented warm and wonderful moments back to me. Always open your blog as soon as I fire up the ol’ computer each morning. Wow thats sounds amazing! Couldn’t be happier to hear my recipe helped bring back those memories (: Thank you so much! Oh they really do look great, I am craving a batch myself!! Yes!! You must try them Ruth! Whenever I see beignets, I’m all for it. I mean, how can anyone resist? But this cardamom rose version sounds absolutely amazing. Totally agree, they’re just perfect! Thanks so much Andrea! 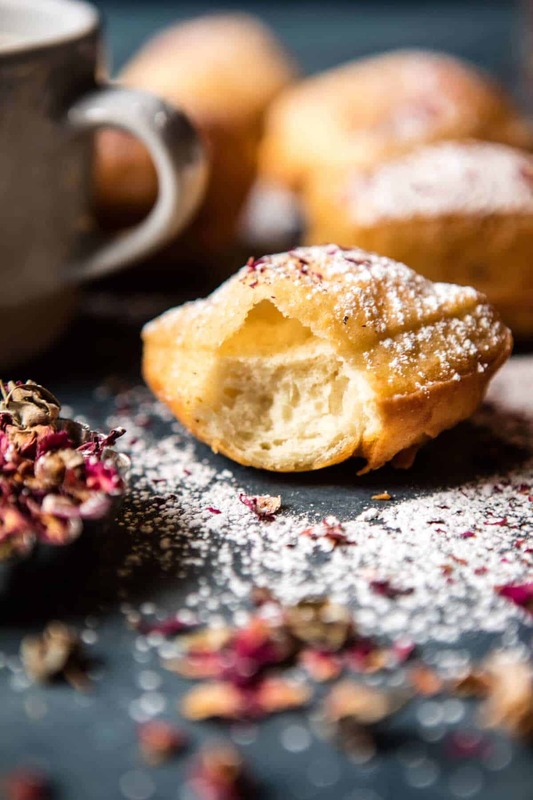 Two of my favorite flavors – cardamom and rose water together in fluffy beignet form – Fat Tuesday couldn’t get any better! Ah yay! So happy you like them!! Thanks Marzia! Right? Theres not much better! Those look so light & fluffy! I promise their easy too! Thanks Kari! Thanks Izzy! Hope you get to make them! These look amazing! I’m so dying to grab one off the screen! I WISH!! That would be the absolute best! Talk about a million dollar idea. I first had beignets a couple months ago in New Orleans and they were awesome. So much powdered sugar! I am excited to give this unique version a try. Thank you!! I hope you love them Kevin! I made these on Wednesday and they were delicious! I used to not like cardamom, but my tastebuds must be growing up or something because now I can’t get enough of it. Love its subtle warmth!! Beignets are such a great treat! You make me want to give them a try! I love when flavors grow on me! Thanks so much, hope you love them! This looks amazing! Since I am a Vegan, is it possible to use an egg substitute, such as a flax egg, for this recipe? Do you think it would work? I can’t wait to try these! I did have one question, would the beignet dough freeze well before frying? Thank you so much!